Bats are a pretty low priority for most Alaskan biologists, but that could be changing due to a recent uptick in the creature’s population. Add to that a disease that’s been killing millions of bats in the Lower 48, and Alaska might be taking note with the rest of the nation very soon. Myotis Lucifugus — better know as a little brown bat. They’re the most widely dispersed bat species in North America. Only weighing about half an ounce, they’re also the most common bat in Alaska. Research here has only started gaining traction within the last 10 years. Biologists are working to gather even the most basic data about the creatures — and now with the added urgency of a deadly threat knocking at the door. Jesika Reimer is an assistant zoologist at the Alaska Center for Conservations Science, based out of the University of Alaska Anchorage. She studies bats in northern latitudes in the U.S. and Canada. “I think that the spread of white-nose syndrome — this fungus that’s killing millions of bats out east — people have become more interested in bats and as more people start to look at bats in Alaska and realize that they’re here and that they’re surviving and persisting, there’s more interest in other people kind of jumping on the bandwagon and looking at them as well,” Reimer said. 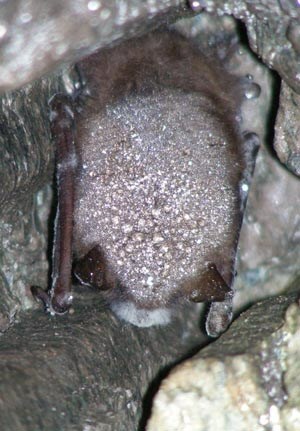 Caused by a fungus growing and spreading in the confined spaces of bat colonies, white-nose syndrome can have a mortality rate of 90 or even 100 percent and little brown bats are especially susceptible to the disease. Over the last decade, white-nose syndrome killed over five million bats in the Lower 48 and has been working its way across the U.S. and Canada. In 2016, researchers found the fungus in Washington state and it might only be a matter of time before it reaches Alaska. With such minimal data available, it could be difficult to know if or when white-nose syndrome arrives and what the effects might be. Bats just haven’t been a high priority species to research. Doing research in Alaska can be tough — access, weather, geography— but a little technology goes a long way. Using specialized recording devices that can pick up bats’ high frequency echolocation, researchers can collect all sorts of general information about their subjects. “And so by putting out these passive recorders, we can record those high frequency echolocations, bring that back to the office and tell what type of bat was there, what were they doing, when where they there and start matching that with climate data to say, ok, what sort of environmental factors were dictating whether we were catching bat noise or whether we got radio silence,” Reimer said. Bat audio can even allow researchers to determine some specific behaviors like drinking or hunting. There’s a steady consistent tweeting noise in the bat’s screech. That’s what’s called a search phase. The bat is flying around, sending out pulses of sound that might bounce off a mosquito or some other other insect. There’s also what’s called the terminal buzz. At this point, the bat’s zeroed in on a meal and is essentially locking on with echolocation. The recorders do have their shortcomings though. Jessica Faust is a masters student at UAA studying bats in the Chugach National Forrest. Faust says the recorders can’t really give researchers a solid population estimate, but the typical method of netting and tagging bats isn’t always that effective either. Since bats are nocturnal, the best time to find them is at night. Summers in Alaska provide a unique challenge for researchers. “I’ve had so many nights in the field where I’ve seen so many bats just go by and you can see them flying near the net, they see it, and fly right around it,” Faust said. Not to mention when they do catch a little brown bat, they need to tag the tiny thing. While researching bats in Alaska can be an uphill battle, organizations like the Alaska Center for Conservation Science and the Alaska Department of Fish and Game have been enlisting the public’s help. 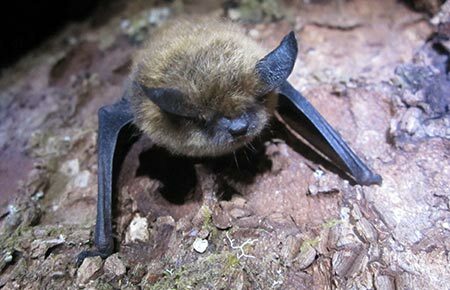 In Southeast where bats are more abundant, Fish and Game have a program where the public can borrow a recording device, attach a microphone to their car and record bats while driving along an established route. Citizen scientists can also get involved by turning in dead bats to Fish and Game or letting the Center for Conservation Science know if you have bats roosting in your house. This story was previously reported by the author for the University of Alaska Anchorage newspaper, The Northern Light.